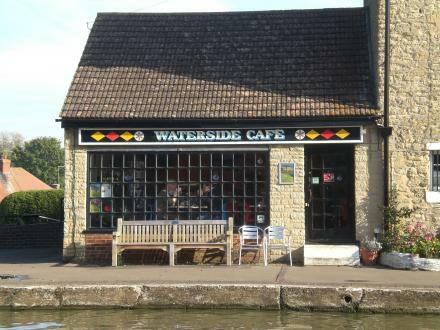 Waterside Café is a place on the waterways minor waterways place place on the waterways major waterways place village town city on the Grand Union Canal (Grand Junction Canal - Main Line - Gayton to Brentford) between Gayton Junction (Junction with Grand Union Northampton Branch) (3 miles and 7 furlongs to the northwest) and Stoke Bruerne and Waterways Museum (a few yards to the southeast). The nearest place in the direction of Gayton Junction is Stoke Bruerne Visitor Moorings (2 day moorings); ¾ furlongs away. The nearest place in the direction of Stoke Bruerne and Waterways Museum is The Boat Inn (Stoke Bruerne); a few yards away. Facilities: rubbish disposal and toilets. The place is a Bar/Restaurant. The BW toilets are at the back of the café and the rubbish disposal in the car park. Information last edited Wednesday the 10th of January, 2018 at 11:17 PM by Shultzy. Bridge Road, Stoke Bruerne, Northampton, NN12 7SB — 61 yards to the southeast. Bridge Rd, Towcester, NN12 7 — 122 yards to the southeast. Northampton — 105 yards to the northeast. Grand Union Canal — 620 yards to the northwest. Stoke Bruerne, Towcester, NN12 7SF — 100 yards to the southwest. 5 The Canalside, Northampton, NN12 7SE — 838 yards to the west. Windmill Cottage 97 Stoke Road, Northampton, NN7 3DB — 1516 yards to the northwest. Unit 1, Towcester, NN12 7XU — 1434 yards to the south. The Tug Store, The Towpath, Grand Union Canal, Stoke Bruerne, Northampton — 96 yards to the west. Northampton — 328 yards to the south. Unit 3 Home Farm Buildings, Northampton, NN12 7XU — 1370 yards to the south. Rookery Lane, Stoke Bruerne, Northampton — 468 yards to the east. The Old Chapel, Stoke Bruerne, Towcester, NN12 7SQ — 105 yards to the northeast. bridge road, stoke bruerns, Northampton, NN127SB — 21 yards to the southwest. Northampton, NN12 6BX — 968 yards to the northwest. Towcester — 838 yards to the west. Bridge Rd, Towcester, NN12 7SE — 19 yards to the east. Stoke Park Pavilions, London — 1293 yards to the south. Bridge Road, Stoke Bruerne, Northampton, NN12 7SB — 54 yards to the south. Stoke Bruerne, Northampton, NN12 7SY — 171 yards to the southeast. Rookery Lane, Northampton, NN12 7SJ — 453 yards to the northeast. 9 Wentworth Way, Stoke Bruerne, Towcester, NN12 7SA — 421 yards to the west. 6 Mill Lane, Stoke Bruerne, Northampton, NN12 7 — 154 yards to the northeast. Church Lane, Stoke Bruerne, Northampton, NN12 7SB — 233 yards to the west. Chapel Lane, Stoke Bruerne, Towcester, NN12 7SQ — 75 yards to the north. Chapel Lane, NN12 7SQ — 71 yards to the northwest. 38 Park Road, NN8 4PW — 1204 yards to the northeast. Rookery Lane, NN12 7SJ — 349 yards to the east. Stoke Bruerne, Towcester, NN12 7SW — 1440 yards to the southeast. Stoke Bruerne, Towcester, N N12 — 779 yards to the southeast. Northampton — 289 yards to the southeast. 3 Bridge Rd, Towcester, NN12 7SE — 20 yards to the east. 871 yards to the east. 746 yards to the southeast. 1014 yards to the southeast.